Numero Uno—“At the recent Emergency Convention [St. Louis: April 7-14, 1917], called for the purpose mainly of defining and declaring the position of the Socialist Party toward the present war and toward war in general, three reports were submitted by the committee chosen to deal with that important matter and submit the result of its deliberations to the convention. A majority report and two minority reports were submitted. We advise our readers to carefully examine each of the reports which are now before the party for a referendum vote.The majority report, submitted by a large majority of the committee and adopted by an overwhelming majority of the delegates composing the convention, is the report that in our opinion states the true internationalist position of our party and the one that ought to be adopted and made the party’s permanent anti-war platform. The majority report has been violently assailed by some hitherto prominent members of the party. They are entitled to their opinion. They assert that the majority report is ‘treasonable.’ We have not a bit of patience for this charge. To us it seems base and cowardly. Let the capitalist press, and not our own comrades, bring this charge. There are time when it is ‘treasonable’ to be law-abiding and when to be ‘treasonable’ is to be true to revolutionary principles and to the cause of humanity. We are aware without being reminded by our own comrades that the charge of treason may be brought against us by the servile hirelings of Wall Street who can construe the law to fasten the charge of treason upon any undesirable citizen, and that, like Karl Liebknecht, we may be put in jail or have to face a firing squad, but we would rather a thousand times meet such a fate than to be craven and cowardly as to resort to parlor tactics when red hell threatens to engulf us for feat of being deemed ‘treasonable’ by the wolves of Wall Street. The opponents of the majority report charge it with being pro-German. The charge is untrue. If it were true we would be just as strongly opposed to it as we are now in favor of it. This charge comes with poor grace from those who are themselves pronounced pro-Ally, and this alone sufficiently accounts for their opposition. We are neither pro-German nor pro-Ally. We are Socialists, international Socialists, and we have no use, not one bit, for capitalist wars. We have no enemies among the workers of other countries; and no friends among the capitalists of any country; the workers of all countries are our friends and the capitalists of all countries are our enemies. The class war is our war and our only war. We have no interest in national wars for ruling class conquest and plunder. In all these wars the workers are slaughtered while their masters wax fat in the spoils of conquest. The time has come for the workers to cease fighting the battle of their masters and to fight their own; to cease being slaughtered like cattle for the profit of the ruling class and to line up in the class struggle regardless of race or nationality for the overthrow of class rule and for the emancipation of their class and humanity. These are our principles and convictions as international revolutionary Socialists, and if this be treason we plead guilty and stand ready to take the consequences. The charge has been brought against the majority report that it encourages the Central Powers to wage the present war for the extermination of democracy and for extending the domain of autocracy and Prussianizing the world. Ye gods! And this is from men who have been recognized as leaders in the Socialist movement. Let me remind these accusers that they are lined up side by side with the vultures of Wall Street without an exception– with Morgan, Rockefeller, Schwab and company; that they are hand in glove with Elihu Root, the deadly enemy of Russian refugees and the arch-foe of the working class and the common people. Would they have us simple enough to believe for one moment that Wall Street is recruiting an enormous standing army and a navy… to fight for freedom and self-government, for justice and humanity? These arch-enemies of democracy, these plunderers of the people, these corrupters of the courts, these debauchers of the electorate, these ruthless exploiters of the working class and despoilers of the nation, these red-handed murderers of our comrades at Ludlow, Cabin Creek, Calumet, Everett, and a hundred other places, these are our enemies and the enemies of our people, and it is a farce and a mockery, if not a crime, to attempt to persuade the working class of America that these, their brutal, relentless, uncompromising enemies, are their friends and waging a war in which they have plunged the nation for their freedom and for democracy and self-government. In their opposition to the majority report these comrades express the fear that it may be adopted because the great majority of comrades do not understand it. Precisely! They have little faith in the intelligence of the lower herd. It is too bad that the great majority are too ignorant to pass intelligent judgment upon a report which declares that the Socialist Party is opposed to having its members slaughtered in capitalist wars; too ignorant to appreciate the fact that Morgan, Rockefeller, and their plutocratic gang are their friends and putting up millions of their stolen dollars to save the poor American workers from Prussian militarism. Numero Dos—“‘I have nothing to offer except a way of looking at things,’ wrote Erik Erikson in 1950 when he published what may be his best-known work, Childhood and Society. Despite his humble preamble, Erikson’s ways of looking at human nature, development, and society have provided remarkable vision and new meaning for lay and professional audiences throughout the latter part of this century. Consider, for example, terms he coined such as ‘identity,’ ‘identity crisis,’ ‘generativity,’ and the ‘life cycle.’ Consider his innovative works on psychohistory and on Native American culture. Recall that he was instrumental in extending psychoanalytic thinking beyond the grim determinism of Freud to a vast, culturally appreciative, postwar readership that sought a psychology of hope in a world of diversity. Erikson was a visionary of our century; his work remains vital, modern, and worthy of empirical research and conceptual debate.Erik Homburger Erikson was born in Frankfurt, Germany, in 1902 and died in Harwich, Mass., in 1994. As a young man he studied art and began his career as a portrait painter. In 1927 he was invited by his childhood friend, Peter Blos, to come to Vienna to draw portraits of children in an experimental school established by Dorothy Burlingham and Anna Freud and run by Blos. It was not long before Erikson was a member of the teaching staff, observing children and immersed in the psychoanalytic world of Vienna and the Freuds. He became an analytic candidate, and his training analysis was with Anna Freud (author of Ego and the Mechanisms of Defense). With the eye of an artist and the mind of a psychoanalyst, Erikson proceeded to study and offer creative wisdom on human development, from infancy to old age. Stephen Schlein has collected 47 of Erikson’s papers that were published between 1930 and 1980. None of these papers has ever been published in a book (or if they were, it was in a substantially different form). There are also 13 wonderful portraits drawn by Erikson. The writings are remarkably diverse and clustered thematically, rather than chronologically: Psychoanalysis and Enlightenment; Configurations in Play and Dreams; War Memoranda; Cross-Cultural Observations: The Communal Environment; Thoughts on the Life Cycle; Reflections on Identity, Youth, and Young Adulthood; Portrait Sketches; and Configurations of Human Potential. The works themselves range from speeches Erikson gave when receiving awards or at ceremonial events, lectures at professional and political gatherings, and scholarly publications. Let me illustrate each section with a brief description of one (or more) of its chapters. In the section on Psychoanalysis and Enlightenment, Schlein publishes Erikson’s tribute to Anna Freud. In a special 1983 issue of the Bulletin of the Hampstead Clinic to honor her after her death, Erikson contributed a piece that recognizes Miss Freud’s unique psychoanalytic contributions, offers a description of the intellectual life of Vienna and of the Freudian circle, and demonstrates the influence of these remarkable people and circumstances on a young and gifted Erikson. This piece is also characteristic of the sweep of his writing in which person, historical and cultural context, and theory are wonderfully interwoven. In the section on Configurations in Play and Dreams, there is a chapter entitled “The Dream Specimen of Psychoanalysis.” In this 1954 piece, we are offered Erikson’s respectful interpretation of perhaps the most famous dream in psychoanalysis, namely, Sigmund Freud’s Irma dream. Erikson approached the dream from his developmental perspective and drew upon Professor Freud’s correspondence with Wilhelm Fliess to understand what was to become the birth of the interpretation of dreams. Freud was 39 and at the edge of a personal, professional, and intellectual crisis. For Erikson, “this dream may, in fact, carry the historical burden of being dreamed in order to be analyzed, and analyzed in order to fulfill a very special fate” (p. 239). From Erikson’s perspective, Freud the revolutionary needed to fulfill what he believed to be his historical destiny; the dream was dreamed not to help him resolve past conflicts per se, but to provide Freud with the material he needed to offer an interpretative view of the unconscious and thereby establish a future for Freud and his creation, psychoanalysis. The War Memoranda section contains a brief but passionate set of papers and comments offered during World War II, with a particular focus on the German mentality. Although Erikson likens the Nazis to adolescents who have become delinquent, he does not propose treatment as a solution. Rather, he calls for a merciless fight and total victory against the Germans and their propaganda. In the next section, Cross-Cultural Observations, Erikson is the social anthropologist as he demonstrates the interplay among history, environment, family, village, and myth in the construction of meaning and behavior in the Native American Yurok of the coastal Northwest United States and the Sioux of the North Central Plains. Erikson depicts the Sioux as “belligerent nomads. [whose] economic life was dominated by the conviction that `you can’t take it with you’” (p. 446), whereas the Yurok “were peaceful and sedentary.preparing themselves spiritually for the annual miracle of the salmon run” (p. 446). He draws on geographical setting and society to explain their remarkable differences. Erikson’s broadening of our understanding of character and development to include the influence of culture is perhaps one of his most important, and enduring, contributions. Unlike Freud, who cast culture as a set of prohibitions, however civilizing, Erikson depicted culture as a vital and invigorating milieu that is essential for identity and personal fulfillment. Thoughts on the Life Cycle brings the reader to perhaps the most recognized theoretical aspect of Erikson’s work. His eight stages of development are found in every textbook of psychology in the Western world. Although dispute about the precision of these stages is prevalent today, Erikson’s vision of development throughout our cycle of life enabled psychoanalysis to move beyond Freud’s more fatalistic view that character is established by age 5 and offers every one of us the perennial hope, now well established, that development is continuous (life after Oedipus), with its challenges, failures, and triumphs. Reflections on Identity, Youth, and Young Adulthood provides works from 1945 through 1972. Erikson’s trademark attention to youth and identity is well represented in this section. The chapter on late adolescence reminds clinicians that the turmoil of an adolescent identity crisis should not be confused with psychotic illness or sociopathy and that the capacity for intimacy is reliant on the reasonably successful resolution of this phase and the establishment of a firm identity. For Erikson, opposition was not necessarily “neurotic” but could represent active engagement, even playful interchange, with one’s family and society and a constructive means of identity formation. This section also contains a contribution to the early feminist literature (“On the Potential of Women,” written in 1965). Portrait Sketches contains eight short pieces and five drawings. These are personal reminiscences and memorials of Erikson’s friends, many of whom have made their own indelible mark on our civilization. Paul Tillich, Peter Blos, Ruth Benedict, and Robert Knight are among the fortunate beneficiaries of Erikson’s literary and artistic portraits. Erikson was a master at recognizing and describing the fortunate collisions of creative individuals and the crises of their respective times: historical greatness occurs when individual solutions are successfully applied universally. The final section, Configurations of Human Potential, is full of optimism, wonder, and concern. “Landing on the Moon,” presented at Harvard University in 1969, lauds mankind’s conquest of space yet cautions that unless “each child born.be brought up to feel at home in his body, mind, and senses.all landings elsewhere remain footless” (p. 746). This collection of Erikson’s writings is for the advanced student of his work. Those without graduate status as an Erikson scholar will be better rewarded by reading Childhood and Society (1) (remarkably prescient in 1950) and Insight and Responsibility (3); by relishing the psychohistorical biographies Young Man Luther (4) and Gandhi’s Truth (5); or by selecting some of Erikson’s groundbreaking essays on identity and the life cycle. In reading Erikson today, with our emphasis on quantitative research, we are best reminded that it was his intuitive genius and artistic vision that led other investigators to the frontiers we are now exploring empirically. He was a great observer of human nature and culture, and he was a theory builder. Erik H. Erikson’s gifts as painter, psychologist, analyst, writer, anthropologist, and social philosopher know few equals. He was a brilliant spokesperson for ego psychology, for the concept of identity, and for development throughout the seasons of our lives. We have him to thank for a spirit of optimism that encourages us all to believe that existence is not fated, that it is ours to remake throughout life’s journey. Erik Erikson (1950, 1963) proposed a psychoanalytic theory of psychosocial development comprising eight stages from infancy to adulthood. During each stage, the person experiences a psychosocial crisis which could have a positive or negative outcome for personality development. Erikson’s ideas were greatly influenced by Freud, going along with Freud’s (1923) theory regarding the structure and topography of personality. However, whereas Freud was an id psychologist, Erikson was an ego psychologist. He emphasized the role of culture and society and the conflicts that can take place within the ego itself, whereas Freud emphasized the conflict between the id and the superego. Erikson extends on Freudian thoughts by focusing on the adaptive and creative characteristic of the ego and expanding the notion of the stages of personality development to include the entire lifespan. Like Freud and many others, Erik Erikson maintained that personality develops in a predetermined order, and builds upon each previous stage. This is called the epigenic principle. The outcome of this ‘maturation timetable’ is a wide and integrated set of life skills and abilities that function together within the autonomous individual. However, instead of focusing on sexual development (like Freud), he was interested in how children socialize and how this affects their sense of self. Erikson’s (1959) theory of psychosocial development has eight distinct stages, taking in five stages up to the age of 18 years and three further stages beyond, well into adulthood. Erikson suggests that there is still plenty of room for continued growth and development throughout one’s life. Erikson puts a great deal of emphasis on the adolescent period, feeling it was a crucial stage for developing a person’s identity. 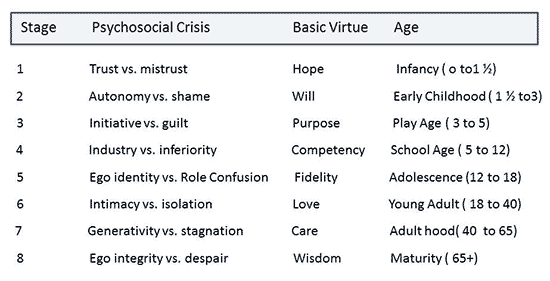 Like Freud, Erikson assumes that a crisis occurs at each stage of development. For Erikson (1963), these crises are of a psychosocial nature because they involve psychological needs of the individual (i.e. psycho) conflicting with the needs of society (i.e. social). Is the world a safe place or is it full of unpredictable events and accidents waiting to happen? Erikson’s first psychosocial crisis occurs during the first year or so of life (like Freud’s oral stage of psychosexual development). The crisis is one of trust vs. mistrust. Consistent with Erikson’s views on the importance of trust, research by Bowlby and Ainsworth has outlined how the quality of the early experience of attachment can affect relationships with others in later life. Around age three and continuing to age five, children assert themselves more frequently. These are particularly lively, rapid-developing years in a child’s life. According to Bee (1992), it is a “time of vigor of action and of behaviors that the parents may see as aggressive”. Too much guilt can make the child slow to interact with others and may inhibit their creativity. Some guilt is, of course, necessary; otherwise the child would not know how to exercise self control or have a conscience. Industry versus inferiority is the fourth stage of Erik Erikson’s theory of psychosocial development. The stage occurs during childhood between the ages of five and twelve. If the child cannot develop the specific skill they feel society is demanding (e.g. being athletic) then they may develop a sense of inferiority. Some failure may be necessary so that the child can develop some modesty. Again, a balance between competence and modesty is necessary. Success in this stage will lead to the virtue of competence. The fifth stage is identity vs. role confusion, and it occurs during adolescence, from about 12-18 years. During this stage, adolescents search for a sense of self and personal identity, through an intense exploration of personal values, beliefs and goals. During adolescence the transition from childhood to adulthood is most important. Children are becoming more independent, and begin to look at the future in terms of career, relationships, families, housing, etc. The individual wants to belong to a society and fit in. In response to role confusion or identity crisis an adolescent may begin to experiment with different lifestyles (e.g. work, education or political activities). Also pressuring someone into an identity can result in rebellion in the form of establishing a negative identity, and in addition to this feeling of unhappiness. One of the strengths of Erikson’s theory is its ability to tie together important psychosocial development across the entire lifespan. Numero Tres—“Prior to the past couple of years, U.S. citizens have more often than not been skittish about appeals to social class, with the exception of a few rare moments of proto-revolutionary fervor, or in select locations–relevant to the energy sector in the Appalachian coal fields–that showed their social contrasts so glaringly that class conflict and class consciousness were inevitable byproducts. Despite this apparent ‘unity,’ many issues complicate the topic of class, which arguably bursts with paradox and contradiction. I highly recommend, in considering today’s essay, that readers consider a quick skim of Howard Zinn’s A People’s History of the United States. The story under consideration here presents a ‘case study’ of the sort of obfuscated understanding that so often accompanies conflicts in the U.S. that have their roots in the relations between the privileged and laboring sectors of society. Generally speaking, and especially for White Americans over the past half-century, ‘middle class’ has been the default descriptor despite its having practically no real content, and, one might add without stretching the realm of the plausible, without much grounding in reality. This lack of class analysis, this frequent rejection of the concept of ‘class’ as applicable to America, has had consistently anomalous and frequently unfortunate results. The number one misfortune attendant on failing to see implications of class would be losing important struggles that should be winnable. Nowhere that I have seen recently is this more glaringly obvious than in the counties of Western Michigan, which present a very interesting contrast of high-end tourist trade, and its attendant Lexus allure, with ‘rust-belt’ industry, and its accompanying patina of underemployment and decline. The scenario is pretty simple. On one side sit passionate opponents of a huge wind-powered electricity development off the Eastern shores of Lake Michigan. On the other side, a coalition has formed to promote this project and, its members say, others that the region should develop with all deliberate speed. And in the middle stand various agencies, institutions, and bureaucracies that grapple with policies and prospects regarding power. For example, the Great Lakes Wind Council came into existence because a conjunction of opportunity and crisis around energy made coherent policy development–around siting, technical standards, and development protocols–critical to effective and efficient engagement of the possibilities of wind. This apparent jobs cornucopia occurs in the midst of a long-lasting unemployment rate officially over ten per cent and actually approaching one quarter of the adult population. Under these circumstance, one might expect that a large operation, orchestrated by an experienced company with an exemplary environmental and community record in Europe, would, in the vernacular, be a ‘shoo-in’ for a ‘fast track’ to testing, licensing, and construction. And one would be dead wrong. But the real story lies deeper, as I discovered in a DailyKos diary, ‘recommended’ and highly attended, that updated folks on this story. The author of that diary –a freelance writer and journalist in his own right, amenable to an interview, took me on a subterranean tour of the politics of dollars and dispensation in a windy place full of desperate people. This is the first part of that story. This was his and some friends’ response to the news that POWER wanted no part of Scandia’s deal in the hostel haven of Pentwater fifty miles North of his native Muskegon. Readers may keep in mind that this has mostly happened like a fast-developing windstorm, mostly taking place during 2010, and everything unfolding over the past year or so. A bad place to live: but also a natural paradise next to a world-class resort town; again, what is going on? This story about energy and conflict hinges on political economy and human geography, which have made the bedrock of Michigan History one of the biggest industrial economies ever, in the midst of wild and unique natural settings that are as charming as anywhere on earth (at least anywhere that gets a lot of snow and not daily sunshine). Eric offers guidance. That ‘except for the coastal communities’ is the geohistorical hub of this tale. Mason and Oceana Counties are more rural than their Southern cohorts, but plenty of industries have also closed up there, Eric assures me. “The big difference is the lake front places.” One can see that in relation to Pentwater, the first jurisdiction to invite Scandia to exit. On a non-profit site that promotes the area, the lead story tells of the local NPR outlet’s featuring the region. Unemployed yacht owners are not oxymoronic, but they don’t need to work for the most part. Anybody with the good fortune to have stayed in a really nice house in a truly gorgeous place on our planet would agree, “Now that sounds nice!” And the point of this article is not to degrade the pleasures of the leisure class. But can we ignore the context that this establishes for the rest of this story? Leave aside the disparities between unemployed workers by the tens of thousands in the immediate vicinity who make less than half per month what well-heeled renters pay for a week’s vacation. Pay no attention to the mother who can’t get her eight year old a backpack because she has no extra cash and no credit, while folks party on their yachts. Don’t even worry that people kill themselves, or exist in a state of semi-permanent depression next door to some of the wealthiest real estate on our fair orb. Perhaps juxtapositions such as these, from a ‘biblical’ perspective or otherwise, just go to show that “the poor are always with us.” I don’t buy this line of reasoning, but that’s a matter of morality, arguably not of equitable social relations, and not obviously of intelligent energy choices. So the problem is not how sad the contrast is, how tragic the socioeconomic conditions, or anything like that, although sadness and tragedy do lurk within the heart of this situation. One aspect of the true issue of Western Michigan’s quandary’s over wind is that the defense of property rights receive such automatic precedence over the expression of social rights, or put another way, that the elevation of the perquisites of wealth above the unrelenting majority’s desire for surcease from want occurs so naturally and commonly. We did not speak for at least thirty seconds. We both had to process it. Moreover, as Eric makes clear, “Politicians are in the thick of this.” An honest-to-God desecration of democracy, in favor of dollars, has occurred and continues to occur. Perhaps Pentwater itself, despite the fact that the folks of Michigan dearly longed for ‘this big old wind farm, might conceivably have mustered a majority against Scandia and its project. But everywhere else the story was lopsided in favor of this renewable energy source of power and jobs. Now he worries that Scandia will just pack up and quit the scene, though he is hopeful that Blue Water Wind will take a different political approach and prevail: all of this in the midst of 97% of the people of Michigan strongly in favor of renewable energy. They think it critical to economic survival, while absentee owners want to preserve views, possibly impacted birds and bats, and hope not to face the prospect of any of the lubricants that wind platforms’ might leak into the lake. Part Two of this story will consider such matters, and several others, more carefully. However, a final point is important, to me anyway, about the sociopolitical aspects of this incredible little tale. Eric describes a ‘wild scene’ at a recent public meeting about the Wind Farm. In actuality, as he makes clear, derision and arrogance have characterized the attitudes of the well-to-do, and they continue to characterize that attitude. The “homeowner segment” at the meeting “used vicious ‘shout-down’ tactics against Deborah Chase” who when she stood to speak and said her residence was the working class village of Walkerville, “they were intimidating jerks,” mean and aggressive, “clearly ma(king) fun of where she lived,” as if she came from a zoo or a sty. “One very outspoken opponent, one of the organizers I think, even apologized for this” brutal rudeness. This sort of idea is also part of the technical investigation that will continue in the next installment. But today’s story, though it is about a potential energy victory, a beneficial development in all manner of ways for the people and the planet we all inhabit together, has to have as a central message what is obvious in almost every aspect of what went down in Western Michigan over the past ten months or so. The United States of America is riven by class privilege and class brutality. Again and again and again, the wealthy have their way–they have their way with the politicians, they have their way (one way or another) with the policies, and they have their way with the poor. Somehow or other, this unconscionable lopsidedness, this destruction of the reality of majority rule with the forms of democracy, has to shift. This seemingly, in the grand scheme of things, small story has an outside resonance, a bellwether’s ring of accurate depiction of the central tendency. A balancing must come to pass, or inefficient energy, and climate change, will be the least of our difficulties. and, finally, looking at the loss of leadership as aging activists fade or turn to the rich, and young people are stretched to their utter limit. And what would Howard Zinn say to all of this? Perhaps something like this quotation from Nate Shaw would come to mind, from All God’s Dangers. This passage was during the depression, another time of cataclysm and transitions in science, technology, and society, a time in which established patterns and business-as-usual leadership failed.